FiberGuide Signs an Agreement with Optical Technology Training (OTT) to Deliver Certified Optical Networking Courses in Africa. 18 May FiberGuide Signs an Agreement with Optical Technology Training (OTT) to Deliver Certified Optical Networking Courses in Africa. FiberGuide is pleased to announce that they have signed a partnership agreement with Optical Technology Training (OTT) to deliver a certified training course in optical networking throughout Africa. The comprehensive, internationally well regarded, 5-day Certified Optical Network Associate (CONA) course will replace the 2-day BICSI certified course previously offered by FiberGuide. CONA is an intermediate level course in which attendees learn the fundamentals of optical networking including the transmission of light through optical fiber and widely deployed commercial optical networking systems. Trainees learn how to design and plan efficient and cost effective high speed optical point to point links and networks that meet today’s and future requirements. Target audience includes transmission and planning engineers and managers, project managers, operation staff and all those involved with planning, design, and implementation of optical networks. Attendees who successfully complete CONA will in future have the option to take a more advanced course. The advanced optical networking course enables attendees to understand trends in higher speed transmission of 40Gbps, 100Gbps and beyond. This will help them learn how higher speed transmission requirements can be met by the systems they design. Under the terms of the agreement, OTT will provide the training syllabus, training materials including the unique OTT Whizziekit virtual optical networking system. OTT will also manage the trainee feedback process and provide certifications. FiberGuide will help market the course, organize classes, and deliver the training. “The OTT/FiberGuide combined effort will guarantee the highest quality delivery of optical communication training to engineers, technicians, and managers. 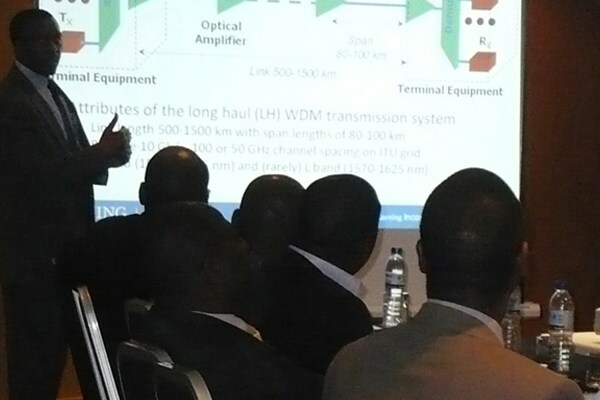 To develop high quality and sustainable optical networks that can support the explosive growth in mobile communications in Africa, engineers need up to date and vendor neutral training programs. FiberGuide, backed by OTT, is well positioned to support that need.”, said Dr. Jabulani Dhliwayo of FiberGuide. “We are delighted to be working with such a visionary as Dr. Jabulani Dhliwayo to empower, through knowledge gained on our courses, those responsible for the deployment of telecoms networks in Africa.” added Richard Ednay, Technical Director of OTT. Based in the Washington D.C. Metropolitan area, FiberGuide is a private company offering technical training to telecommunication and IT companies and consulting services to clients seeking data center colocation and wide area networking solutions. Through a master agent, FiberGuide represents thousands of data center and global network providers, making the company a one stop gateway to all key providers. Set up in 1989 in the UK, OTT develops high quality professional training in fiber optics and optical networking. OTT unique advanced certification courses are developed by Richard Ednay, a world leading expert in fiber optics. Their training is designed for those who want to understand the subject in depth, to achieve the best in their roles, to be as prepared as possible for the challenges facing optical networking today and tomorrow.